Can you envision the pace at which e-waste is growing? It is definitely multiplying at a rate faster than ever imagined. To balance this out, San Francisco E-waste, a division of Blue Star Company,employs a team of specialists who are adept in their own sphere of influence. They have a command over the comprehensive knowledge of e-waste clearance and reprocessing techniques. San Francisco E-waste has maintained its record in the field of recycling and is known as the best recycler in the public eye. We know that as producers of e-waste, you do not have ample time to deal with its management along with the other important errands in your life. We encourage you to be aware of the effect on our planet that old, unusable electronics has. While it is in our DNA to help, we might not know where to begin. The comprehensive services offered by San Francisco E-waste will create less stress while educating you on how the process works. Recycling, reclaiming and reusing methods reflect a great cause…our planet, our children’s future. Electronic waste, or e-waste, is a general term used for the electronic products that have become non-working, unwanted, or obsolete. In other words, they have reached the end of their purpose. Either your electronics no longer serve you, and have been replaced by upgrades, or they no longer work correctly. This could be due to technological advances, forcing them to become outmoded. Your friend in the e-waste business, San Francisco E-waste, sees your waste through a different lens. We make every effort to save your electronic devices from reaching the trash bin after the completion of their life cycle. 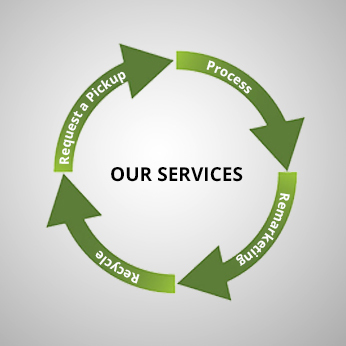 We invite you to contact us before discarding your e-waste. If you have no intention of reusing your technology, contact our experts who will guarantee an easy, stress-free process of collecting it from you. Once you recycle with us, we will hand you documentation showing that you have safely recycled your equipment…you have done your part! We thank you for reaching out to San Francisco E-waste for your asset disposition and data destruction needs. Request a pickup – Click on request a pickup and fill out the form and one of our sales people will get back to you within minutes to 24 hours. Process – San Francisco E-Waste, an authorized recycler, will educate you on the proper handling of your unusable e-waste and welcome the items which are technically considered to be e-waste. As our moral responsibility, we encourage our customers to reduce and reuse before opting for recycling. We segregate the items collected into the different categories depending on their future usage such as: destruction, remarketing and recycling. Remarketing- As a responsible recycling company, San Francisco E-waste will remarket or repurpose your unwanted assets. All data will be erased keeping your data from ever reaching the hands of others. Remarketing makes sense, preventing your electronics to ever reach a landfill. Recycle- The recycling of your items is scrutinized and prevents the items from being dumped into the landfills which have already exceeded their capacity. Our recycled materials are used by a wide variety of industries to produce new products. Not only this, it leads to the creation of new jobs and provides a safe planet to live on. Doing this, we are very concerned about the safety of your data and keeps it as our priority. Thus San Francisco E-waste provides convenient and safe commercial and residential recycling services according to the guidelines set by the EPA.